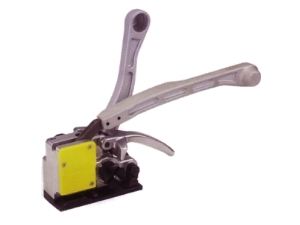 Hand operated HEAVY DUTY manual ratchet type COMBINATION strapping tensioner and sealer for 13mm PET strapping. Designed to tighten and seal 13mm PET strapping around pallets and crates. Used with 13mm GRIPPER SEALS (CP34). Simply load the gripper seal into the front of the machine; feed the strapping through the machine and around the pallet ; and tension until tight. Pushing the sealer handle forward crushes the CP34 gripper seal thereby sealing the strapping tight. Squeeze the cutter handle to complete the process. Recommended for medium volume applications.